Jacob buys his own Valentines Day cards and gifts these days. 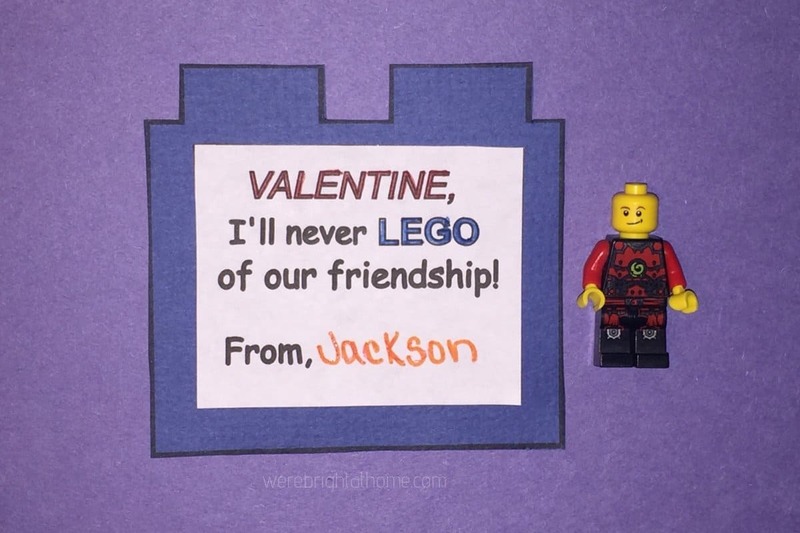 So I have to come up with Valentine’s Day cards that Jackson will like. He says, “They have to be normal”. 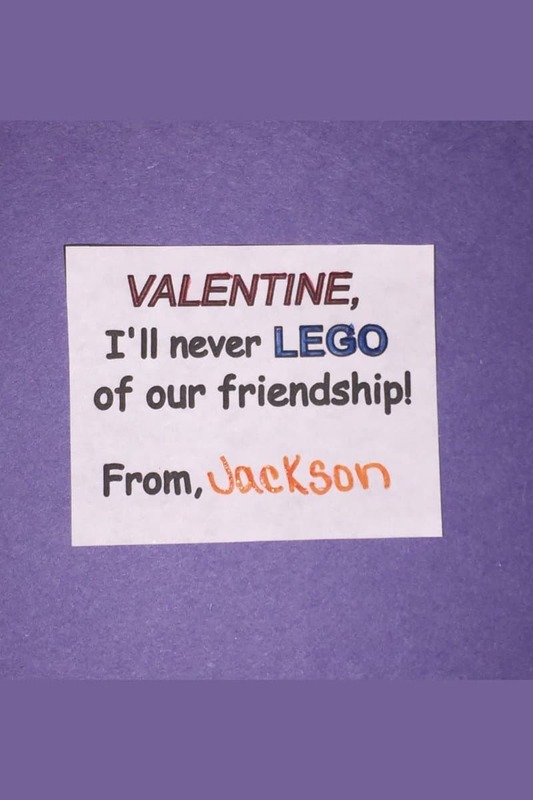 Jackson hasn’t liked any of the Valentines in the stores. So we headed to Pinterest for some ideas. I think these are normal and pretty clever for any boy or girl that likes Legos. 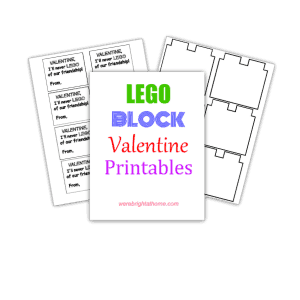 Follow this tutorial if you are looking for Lego Valentines with free printables. 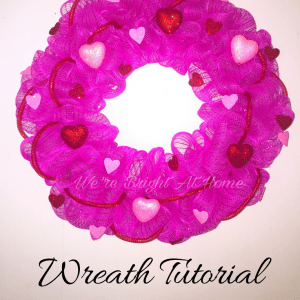 Grab your free printables and follow the following tutorial. Your kids will have the coolest Valentine cards in class! 1. 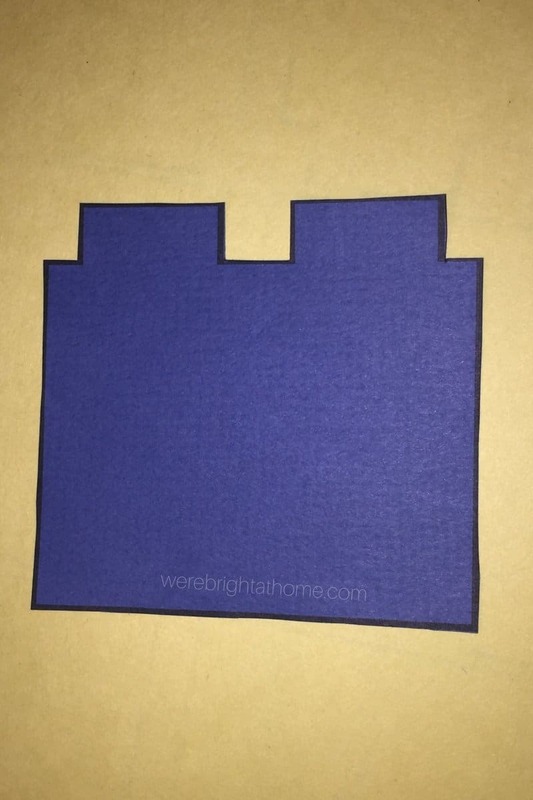 Print the Lego block shape on your choice of colored paper. I used construction paper. Cut out Lego block shape. I used my Silhouette Cameo. 2. Print the message on white card stock. 3. Let your child color and decorate. Have them sign their name. Cut it out. 4. Use double-sided tape or glue stick to attach the message piece onto the Valentine. 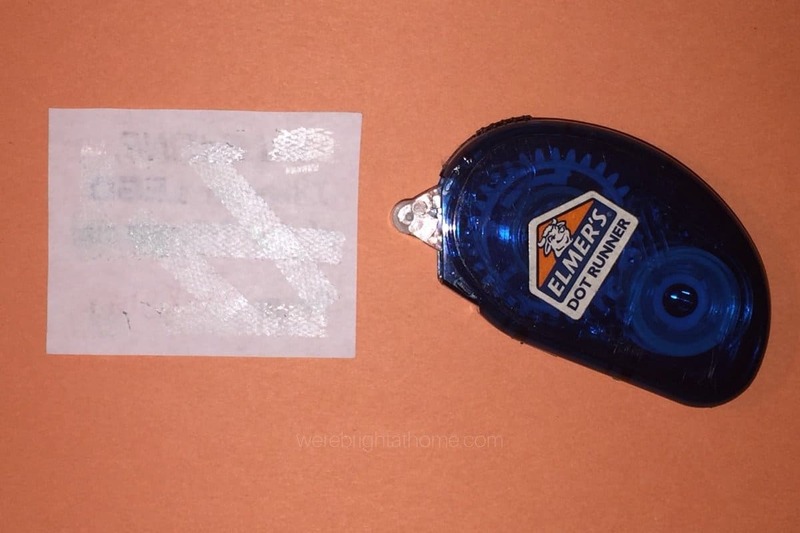 I used double-sided tape. I like it better than glue because it doesn’t try to seep through the paper. 6. You don’t have to stop there! You can use a hole punch to punch a hole into the Valentine card. Then add each child’s name to a square of paper to make a name tag. Use bakers twine to attach it to the card. This is also a good place to attach a friendship bracelet or other small novelty. Or if your child has a lot of Legos he/she would like to share with their class, they could do as Jackson did here and add a Lego guy. 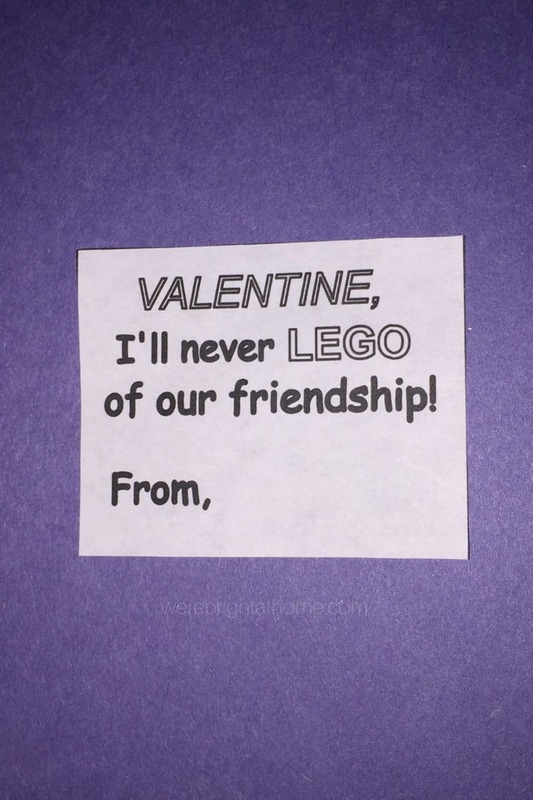 They could put the toy they make in a little plastic jewelry bag and staple it to the Valentine. 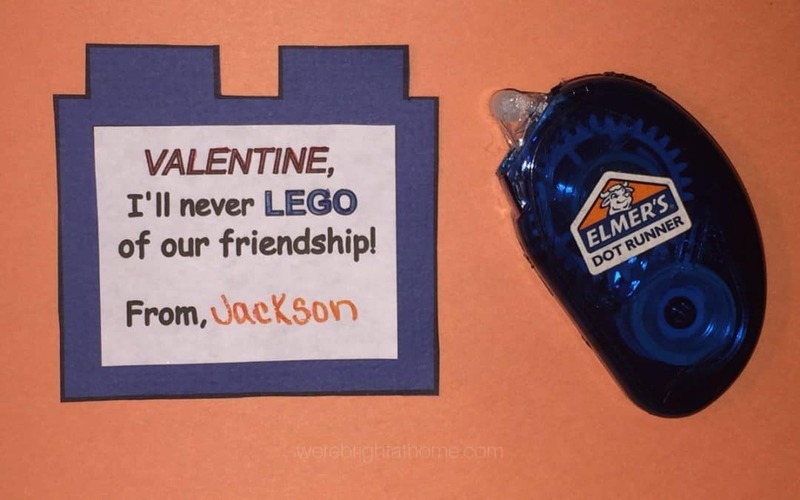 Your child could think up other things to make from Legos to give to their classmates. 7. Give one to each friend in class! 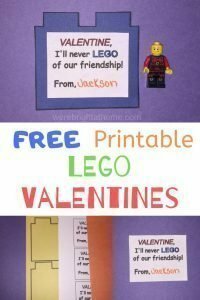 I love this DIY Lego Valentine idea! It’s a great way to let your child be creative all while sharing with their friends at school. If you enjoy making things check out the DIY category on this blog. Be sure to grab your copy of the Lego Valentine Printables and follow along with the tutorial above. Click the image below to get yours! So cute! Who doesn’t like Legos?! Thanks for sharing!